Dietes iridioides (L.) Sweet ex Klatt in T.A.Durand & H.Schinz, Consp. Fl. Afr. 5: 156 (1894). Synonym Moraea iridioides in Bot Mag 693: Root fibrous, rootstock in old plants elongated into a short woody cicatrized caudex, upon which generally stand two or three fan-spread leaf-fascicles. Stem longer than the leaves, c ompressed, dark-green, rigid and fomewhat Woody downwards, smooth, furnished at the joints with many alternate, remote, stiffish, adpressedly convolute, spathe-like, stem-embracing Bractes, some of which are sterile, while from others issue an adpressed branch, and these are either simple or paniculately subdivided, lower ones longest and wand-like, all similar to the stem, but less flattened. Leaves many, perennial, from upright distichly diverging, linear-enfiform, acuminate, stiffish, dark-green, very smooth, nerveless, equitantly imbricate, and very rigid downwards. Involucres herbaceous, convolute, ft iff, 2 — 4-flowered, flowers supported by a slender pedicle equal to the involucre and each separated from the other by a membranous spathe or valve. Corolla white, regularly patent, fegments equal in length, connected at the base, outer ones twice the broadest, oblong-obovate, narrowed downwards into straight patent ungues nearly the length of their laminae, with a longitudinal tomentose ridge on the inside, outwards furrowed down the middle, sides inflected; inner segments lanceolate-obovate, rather acute, with shorter, more patent, and less definite ungues : stigmas petaloid, bilabiate, about equal to the outer ungues, erect-patent, oblong with a blue longitudinal keeled ridge ; inner lip bipartite segments acuminate ; style triquetral, fhort ; filaments flat-subulate, standing on the bases of the segments, contiguous, but in general not connate, though they often are so. Capsule largish, cartilagineo-coriaceous, oblong, obsoletely triquetral, corrugately lineate, feeds very many, close, compressedly angular, their outermost side rounded to the valves. It has fruit nearly ripe and blowing flowers at the same time. Found by Thunberg in the interior of the Cape country in Hottentot's Holland, in a wood not far from Sea-Cow River, near a houfe called Kock's-Farm. 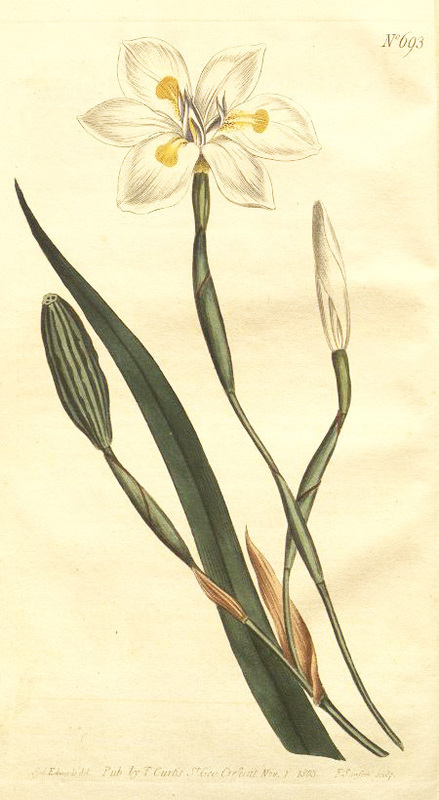 Cultivated by Miller in 1758, who received the feeds from the Cape under the title of « White Water-Lily ;" it is of the easiest culture, and will grow many years together (without parting or removing) in the same pot; requires plenty of water; blooms several weeks in succession during the Summer months ; produces seed in abundance ; owing to which and its long standing in the country it is now one of the commoner! of its tribe in our collections ; has no smell. Our drawing was taken at the Botanic Garden, Brompton. We are rather surprised it has not before been discovered to be the same with Thunberg's Iris compressa ; his description is full and correct. G.